To formulate Paracetamol Tablets using Direct Compression (DC) method. Direct compression is the most simple and economical method used in tableting. Excipients are added to the active pharmaceutical ingredient which is then thoroughly mixed before compression to form tablets.1 In wet and dry and dry granulation, there is no pre-treatment of the powder required. 2 In this method, it is easier to process due to less unit operations, less machinery, fewer numbers of personnel and time efficient.3 Powders with poor flowing properties and bad compressible characteristics are not suitable for this method. In this experiment, the paracetamol powder is used which possess suitable characteristics for this method to be used due to its large particle size, spherical in shape and good flowing properties. Please refer to PP 353/4 Dosage Form Design 2 lab manual page 2. Direct compression method is the most common method used for tableting. Others include wet and dry granulation method which involves more complicated process. Direct compression provides much simpler, efficient and economical process in manufacturing tablets since only two vital steps are involved which are blending and compaction. However, excipients are required to ensure proper compression of the powders to form quality tablets.3 In this experiment, paracetamol and excipients are mixed or blended together which then compressed directly using rotary press machine fitted with 12mm circular flat punches.4 Basically, this machine operates in 3 stages which are filing of the die with powders, compression of powders and tablet ejection. Direct compression method provides various advantages. Its use in the pharmaceutical industries is cost effective, high stability, improved dissolution, less wear and tear of punches and simplified validation.2 Moreover, this methods requires fewer processing steps and less requirements on equipment, time, space and labor input leading to lowered cost production.7 Besides, this method is also suitable for the production of thermo labile and moisture sensitive active ingredients. This is because dry blending eliminates heat and moisture, increasing the stability by preventing any hydrolysis to happen. 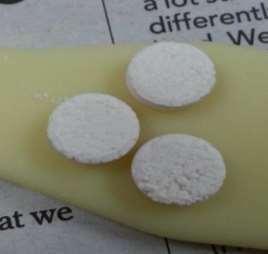 During the experiment, various defects were found in the tablets produced. In a few tablets, cracking and chipping were found. The tablets tend to disintegrate easily with light force exerted on it. Cracking can be defined as small, fine cracks observed on the upper and lower central surface of the tablets. On the other hand, chipping is the breaking of tablet edges, while the tablets leave the press or during subsequent handling operations. These defects may be due to the large size granules, too dry granules or granulation too cold. 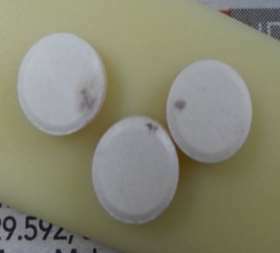 In order to prevent this, reduce the size of the granules, moisten the granules properly and add proper amount of dry binders and compress the powders at room temperature.8 The other defect is that some black spots are present on the tablets. This may be due to impurities present in the tableting machine due to improper maintenance. As a conclusion, direct compression method is an economical and most common method used in the pharmaceutical industries for the manufacturing of tablets due to its cost effectiveness and fewer steps of operations. Excipients like Explotab and Magnesium Stearate are responsible to facilitate the tablet formulation by acting as disintegrant and act as lubricant, respectively, to improve the dissolution and flowability of powder. Rana AS, Kumar SLH. Manufacturing defects of tablets:a review. Journal of Drug Delivery & Therapeutics. 201; 3(6):200-6. "Direct Compression to Create Paracetamol Tablets." UKEssays.com. 11 2018. All Answers Ltd. 04 2019 <https://www.ukessays.com/essays/biology/direct-compression-create-paracetamol-4238.php?vref=1>. "Direct Compression to Create Paracetamol Tablets." All Answers Ltd. ukessays.com, November 2018. Web. 23 April 2019. <https://www.ukessays.com/essays/biology/direct-compression-create-paracetamol-4238.php?vref=1>. UKEssays. November 2018. Direct Compression to Create Paracetamol Tablets. [online]. Available from: https://www.ukessays.com/essays/biology/direct-compression-create-paracetamol-4238.php?vref=1 [Accessed 23 April 2019]. UKEssays. Direct Compression to Create Paracetamol Tablets [Internet]. November 2018. [Accessed 23 April 2019]; Available from: https://www.ukessays.com/essays/biology/direct-compression-create-paracetamol-4238.php?vref=1.